In the past few months, Places No One Knows has been getting realer and realer, turning into something undeniably solid, acquiring the various characteristics that make it more and more like a book. You can read an excerpt on the Entertainment Weekly site. It’s on Goodreads and Amazon. I wrote a book, and it’s about dreams. It’s about sleeping and not sleeping. It’s about boys and girls and ideas and feelings and the towering shower of sparks that happens when all those things collide. 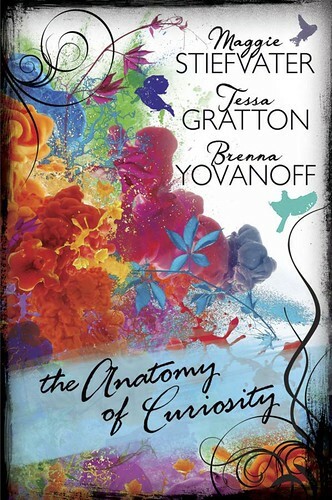 The follow-up to the acclaimed novel The Curiosities: A Collection of Stories by Maggie Stiefvater, Tessa Gratton, and Brenna Yovanoff. We wrote another book together! It is about writing fiction! And also, it is absolutely full of fiction. It’s a collection of novellas, and it’s a nitty-gritty exploration of how and why and all the other complicated considerations that go into figuring out the way you want to tell a story. It was written in Virginia and in Kansas and while tucked away in coffee shops and tearing across Nevada along I-80, and parked sadly in Nevada waiting for the engine to cool, and it is about writing, but it’s also a celebration OF writing. Mostly though, it’s a story about three different ways of getting to The End. I keep telling myself that I’m going to be a good blogger. SUCH a good blogger. One of those dependable, accountable ones who follows a schedule and is all about tidiness and consistency and showing up to appointments on time and remembering to water the plants. However, as we inch closer and closer to December, it’s becoming more and more apparent that all my good intentions and my attempts at time-management are … kind of a lie. Sometimes I dream that there’s a mean octopus on my ceiling. The way I know it’s mean is that if it were a nice octopus, it wouldn’t lurk around on the ceiling in the dark like a creeper, it would just wait until morning and then come say hello. But this is clearly a mean octopus, and as a result, I don’t trust it. I practice constant vigilance. I keep my eye on it. Also, it’s in that awkward beginning stage where I absolutely can’t talk about it in any practical sense because it’s still only a delicate collection of impressions and ideas and assorted sentences and characters I barely know. It’s still basically an ugly little grub just waiting to turn into something fancy—as in, Tess and Maggie have seen approximately one page, and Editor Jocelyn has seen none of it at all. However, because I’m really bad about always wanting to share all the things I’m excited about, I think I’ve worked out a way to kind of act it out in sounds and pictures without really giving anything away. Sometimes I talk about baking on here, which doesn’t really have anything to do with writing, but is still a reasonable thing to talk about. Because I like baking. I’ve been doing it since I was really young, thanks to the fact that being homeschooled always left my afternoons free, and early afternoon is, as everyone knows, the very best time to prepare something delicious. I am not, however, what I would consider a natural baker. My mom and my sister both excel at it. They have a flair for it. They have an inherent understanding of this crazy thing called craftsmanship. I … do not. I’m too meandering, too unstructured. I like flourishes and tangents and experiments and never doing things the same way twice. While this probably constitutes retreading old ground, I feel that I should take this opportunity be very clear. I like horror movies. A lot. Like … I really, really like horror movies. But I just have this feeling that anything I could come up with wouldn’t mean that much. The true, honest thing is actually very simple. I saw my first horror movie when I was six (It was House. It was terrible. ), and since then, I’ve just kind of been fixated. What happened is, Maggie Stiefvater recently wrote a wonderful and highly detailed post dissecting the intricacies of revision, and the response was tremendous. The resulting discussion involved a lot of people saying they wished more authors would share their process with this same level of detail, and since Maggie is by nature a helpful and motivated person (also, she is organized), she asked a bunch of us if we’d be willing to participate in what has essentially become a series!